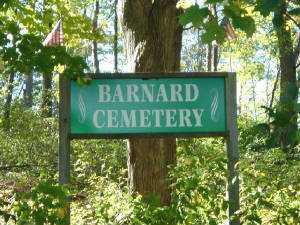 • Barnard Cemetery (North Street Road) west side of County Route 62 in the south central part of town. 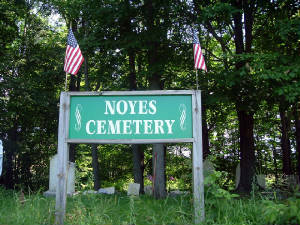 • Noyes (Seeley) Cemetery is located on the east of the south Ridge Road, County Route 48, near the Richland town line. • Pioneer Cemetery is in the north west part of the town near the Jefferson County line known as the Goodenough District. • Scripture District Cemetery is south of Sandy Creek village, just west of U. S. Route 11 on the Fraser Road. 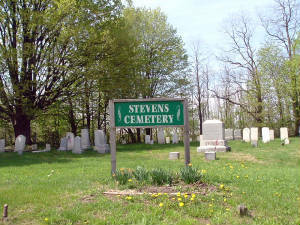 • Stevens District Cemetery is located on the Orwell Road (County Route 22) on a hilltop. 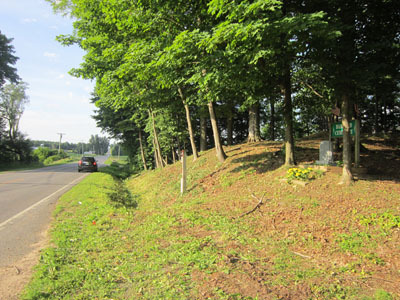 • Morey Family Cemetery was moved, late in the 19th century, from the vicinity of the Harmon Lindsey farm on Route 15 to Woodlawn Cemetery as was an even earlier cemetery located about where Harwood Drive meets the Ridge Road. • Rice Family burying ground is located south of the Hadley Road. • Other pioneer grave sites, never marked, have disappeared into the soil of the homesteads which their occupants cleared. Below: Work is underway on clearing brush and small trees at Barnard/North Road Cemetery. This cemetery is again visible from the road. Woodlawn Cemetery...the original purchase of land for burial purposes was bought in 1820 and is what is now known as the "old part" of the cemetery which is located on Lake Street in Sandy Creek. In 1866 Union Cemetery Association was formed to maintain the cemetery. Around the turn of the 20th century more land was added and again in 1965 a small tract was purchased. Woodlawn Cemetery/Union Cemetery Association has been newly formed and its President Jim Allen would love to hear from lot owners and anyone interested in keeping this cemetery maintained. The cemetery is a not for profit corporation and each lot owner is a member and part owner. Contact Jim Allen at 387-3691 or e-mail at j1sam@yahoo.com if you can help. February 2012 Woodlawn News: Union Cemetery Association has applied for a grant to repair all "unsafe" stones in the cemetery. The Association has met with Mike Seelman to establish Rules and Regulations for the cemetery and are working to update the by-laws. There are new Section Markers (21). A large map has been created and placed at the entrance to the cemetery for visitors. The monthly meetings are held at the Sandy Creek Town Hall on the last Wednesday of the month at 7PM and is open to all interested parties. Wesleyan/Boylston/Sandy Creek Cemetery...this small cemetery is located on County Route 15 about two miles east of Lacona. An abandoned cemetery book series has been completed and will feature pictures of the stones and a family genealogy as it pertains to Sandy Creek history. On Earth Day, April 27, 2003 a few hearty souls and myself met at Noyes Cemetery and worked on raking, mowing and planting. It was a beautiful day and half of the cemetery was completed. Thank you to Phyllis LeBeau, Rachel and Pat McConnell, Donna and Gary Coe and Margaret Kastler. Weather permitting, I will begin probing for buried stones as we have a listing of who is buried there and some stones are missing. Among the burials is that of Thomas Baker, a Revolutionary War Soldier, Robert DeLapp, 94th NY Infantry Civil War Soldier and Devereaux A. Samson, Co. E NY Heavy Artillery Civil War Soldier. Other surnames include Stewart, Russell, Rogers, Roberts, Porter, Plumley, Noyes, McLean, McGuire, Look, Lester, Johnson, Howlett, Hibbard, Gray, Button, Barlow, and Allen. This cemetery is located on the Ridge Road, County Route 48. The Noyes family located on the Ridge Road and was one of the pioneer families to settle in Sandy Creek. Burials in Stevens Cemetery are Ackler, Ames, Babcock, Bartlett, Blodgett, Burch, Cole, Covey, Doneburg, Goff, Hedger, Hurd, Kipp, Lester, Mareness, Panghorn, Porter, Parish, Salisbury, Priest, Rice, Rich, Rawson,, Shetrau, Stacy, Stevens, Tracy, Vanderhoof, Wart, Weston, White, Wood and Williams. 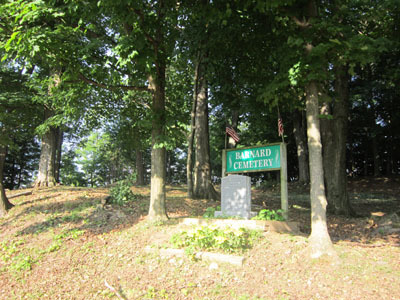 Barnard (North Road) Cemetery is located on North Road just out of Pulaski, toward Sandy Creek, is in need of a lot of work. The cemetery census was done in 1952 by Mrs. Claude Taplin, Miss Nannette Hamer, Mrs. Philip Coble, Miss Nancy Taplin and was compiled by Mrs. Anna Herriman. The records show 25 burials at Barnard Cemetery. Only a few stones are visible. The family names are Alexander, Champney, Chapin, Clark, Empie, Greenwood, Herriman, Meacham, Meigs, Muzzy, Samson and Walworth. The earliest burial is L. Meigs who died September 14, 1809. Pioneer Cemetery is where the Lindsey Family first located as early as 1803 and they are buried here! Pioneer Cemetery is located in the northwestern part of Sandy Creek, the Goodnough District. Family names are Sprague, Lindsey, Potter, Woolaver. Eunice Lindsey, daughter of Stephen and Sally McNitt Lindsey died in the summer of 1803 at the age of 12 or 13 and is said to be the first death in the Town of Sandy Creek. Chris Vallejo did his Eagle Scout Project on the Scripture Cemetery in 2002 to honor those buried there. Chris did a great job. Flowers were planted and many of us are anxious for spring to see the results of his hard work. Chris created posters and a book with the progress of the work and the names of the people buried there. Thankfully all stones were found and accounted for. Seventy people are buried there. 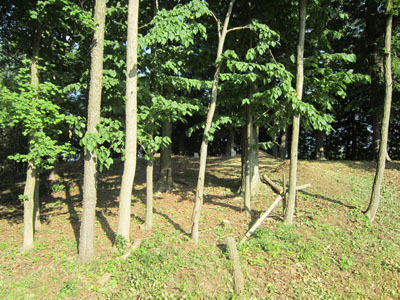 (There may be 5 unmarked graves that have not been recorded.) The earliest burial was that of Joel Morey, son of Moses and Philottee Morey who was drowned on April 24, 1819 at the age of 16 years, 4 months and 19 days.Elizabeth Bargy (1764-1853) was the wife of Peter Bargy (1753-1845) a Revolutionary War soldier. Both Peter and Elizabeth Bargy are buried in Scripture Cemetery. Peter died at the age of 92 and Elizabeth at the age of 89 years. We are in the process of repairing gravestones in the six abandoned cemeteries within the Town of Sandy Creek. Our abandoned cemeteries are in need of restoration. Some of our earliest pioneer gravestones have broken or have fallen off their bases. These cemeteries by law belong to the town and our road crew men do a good job of keeping them mowed, but many of the early families have passed on or moved from the area to find work. Our parents and grandparents always looked after their family gravestones and every Memorial Day planted flowers. Times have changed and the responsibility is ours. We have just the people to do the job. Cemetery stone restoration is what they do and their preservation skills are impressive and they are local people. Help us if you can! The project is scheduled to begin and our progress will be on view at the History Center and through articles in the Historians Corner column and on this web site. Anyone one who wants their families headstones repaired could contact Artisan Engraving Monument Services at 783-7044.